Thomas Burberry developed gabardine—a rugged, water-resistant twill—in 1880. After submitting a design for an army officer's raincoat to England's War Office in 1901, he was commissioned to create a gabardine coat for the British Army's officers. Known as the Tielocken, it kept soldiers warm, dry and well ventilated during the Boer War in South Africa. It took Burberry more than two decades and a world war to perfect the coat's design. By World War I, he had made the coat a bit lighter and gave it shoulder epaulets, storm flaps and a D-ring belt. More than half a million British troops wore them while fighting in the trenches. So many, in fact, that the name stuck. 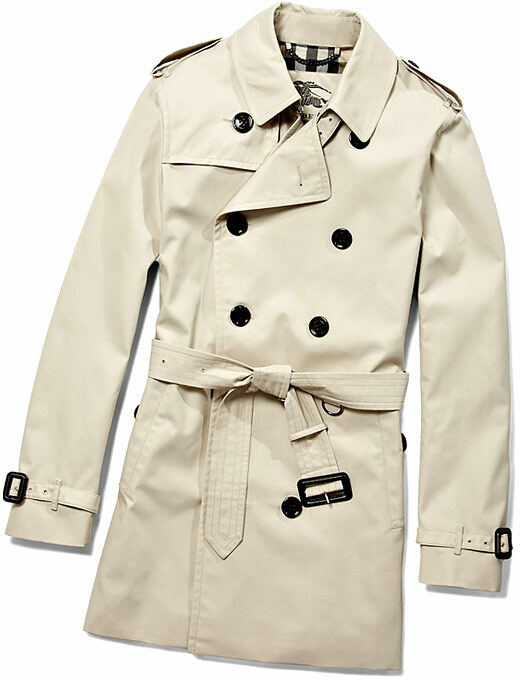 Like many military pieces, the trench coat jumped from the battlefield into the mainstream after the war. Hollywood's leading men (and women) were soon pulling on the khaki coats, which became bonafide design classics. After all, every element on the coat was created for a reason. Which explains why the design has remained virtually unchanged since Thomas Burberry's day. When the label's current designer, Christopher Bailey, came onboard in 2001, his goal was to update Burberry's classic coat without losing any of the tried-and-true purpose. Case in point: This shortened, lighter style with a trimmer fit (perfect for spring showers) that still has all the reliability and smart style of the original. The under collar features Burberry's signature check pattern. The standard trench has raglan sleeves. This has more fitted, set-in sleeves. Bailey fastens his belt at the back. "It's a bit more relaxed." The buckles are wrapped in leather. Humphrey Bogart in Casablanca , 1942. A British officer during World War I. Prince Charles, in the mid 1960s, carrying a classic Burberry trench. Meryl Streep in Kramer vs Kramer , 1979. The trench coat is iconic, unique, functional, ageless and timeless. Developed by Charles Macintosh, who created the waterproof, rubberized cotton fabric used to make the coat. The trim-cut coat doesn't have lapels or epaulets. Often cut from water-resistant, breathable gabardine fabric, it is usually double breasted with a fuller body, belt and shoulder epaulets.